The SnagXtreme app lets you watch free independent movies—on demand. Watch great movies, share them with your friends, read reviews, watch interviews and film festival coverage, and more. Note Xbox Live Gold membership is required. Select SnagXtreme to download and install the app. To start the SnagXtreme app later, go to Video, My Video Apps, and then SnagXtreme. Go to Video, My Video Apps, and then select SnagXtreme. The Featured hub is displayed. When you launch the SnagXtreme app for the first time, you’re prompted to activate your device for a personalized experience. This is not required to view content within the app. However, when you activate the app, you get personalized recommendations and have the ability to manage a playlist across multiple devices. To activate, select Activate Your Device. On the Activate screen, note the activation code that is displayed. 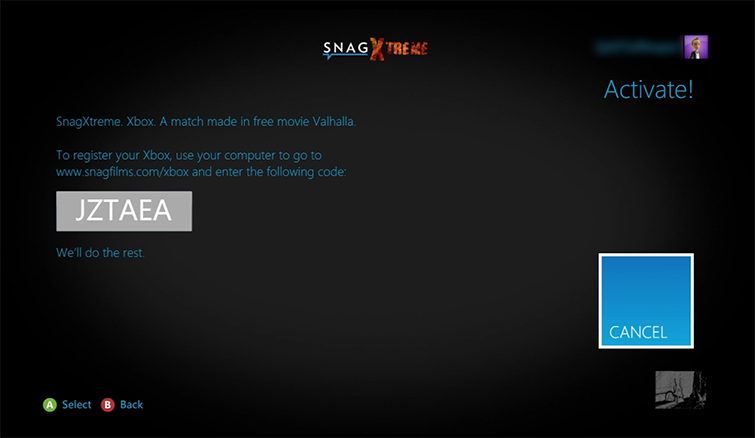 In a browser on a PC or other Internet-enabled device, go to www.Snagfilms.com/xbox and enter the code displayed on the Activate screen. 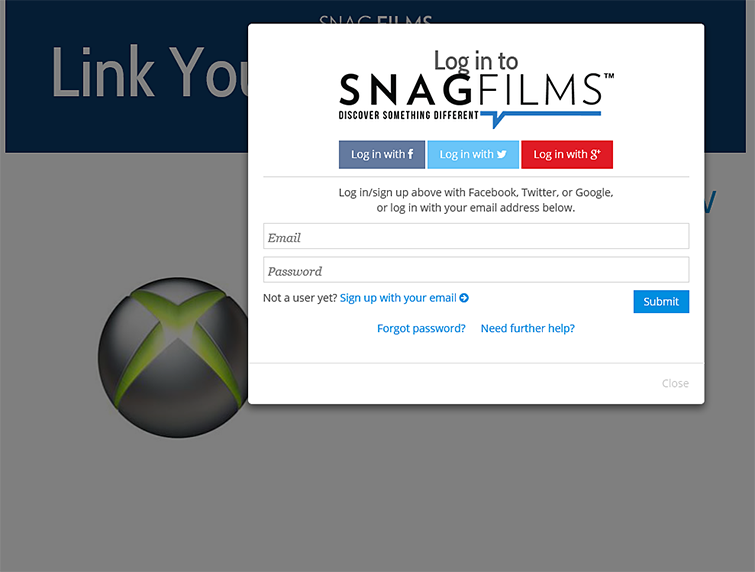 Sign in to SnagFilms using a Facebook, Twitter, or Google login. 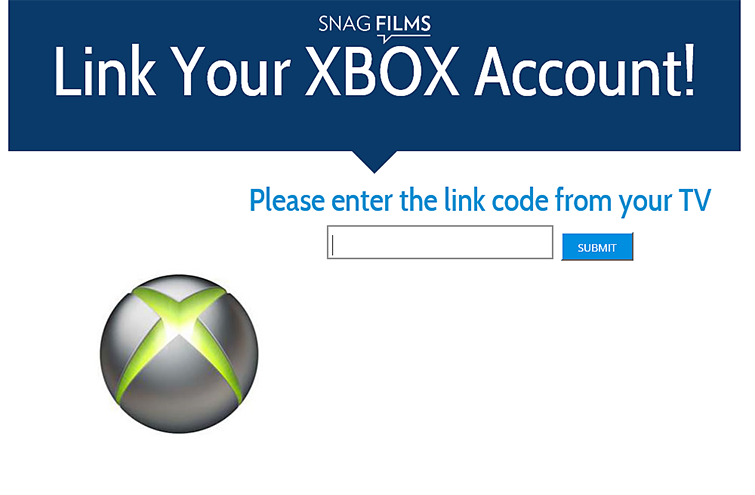 A success screen is displayed on the SnagFilms website and on your Xbox screen after the code is verified. 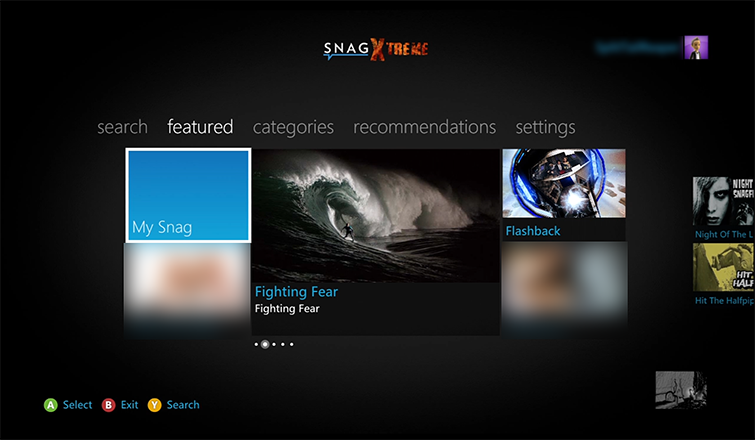 The SnagXtreme app starts on the Featured hub. Watch any of the feature programs displayed in the center of the hub. Select My Snag to access your playlist or previously viewed films. Select something to watch. You can share your choice through Facebook or just press Play. If you use Family Settings to control what content you share through Xbox Live, the SnagXtreme app won't start when a child account is signed in, unless you enter the personal identification number (PIN). ¿Quieres contactar con el Soporte técnico con referencia al problema "Set up the SnagXtreme app on Xbox 360" acerca del que estabas leyendo o con referencia a otro problema?